The Escalating War for Perks: What’s Happening To Employee Engagement? Today companies spend over $40 billion a year on perks, well-being programs, and other non-cash benefits. The impact of increased investment in benefits on employee engagement and retention is far from conclusive. For example, while overall employee engagement is increasing slightly, nearly one-third of employees are actively disengaged at work. What are the true drivers of employee success? How can HR and business leaders improve the employee experience? In this research-based presentation, Josh Bersin, Global Industry Analyst and author, will share the actual drivers of engagement and retention, as well as best practices on how companies can effectively increase engagement and avoid the guesswork that is prevalent today. While most organizations today are leveraging employee engagement surveys, 80% of leaders don't believe their programs are driving meaningful change. This signals something is fundamentally wrong with how we have been approaching employee feedback. There is a great opportunity to shift away from the traditional focus on survey events and action plans, and instead, adopt a scalable and sustainable approach to using employee feedback to fuel change. In this webinar, you will learn how to design a measurement strategy that empowers managers to not only listen to feedback, but do something with it. Archana Ramesh is a Senior People Science Consultant with Glint. Before joining the Glint team, she led People Operations and Technology for a fast-growing mid-size public technology company. Along with holding global roles, Archana has lived and worked in Western and Eastern Europe and is able to leverage her international experience to partner with global customers. Archana holds a M.A. in Social/Organizational Psychology from Columbia University where she focused on leadership development and organization transformation. Employee engagement and retention is the #1 issue on the minds of today’s CEOs and is a top discussed topic in HR. As a result, organizations have implemented solutions and tools that help gather feedback regularly, resulting in greater access to and an accumulation of feedback data than ever before. But the real challenge is, how can we translate the deluge of data into meaningful action? In this research-based presentation, Josh Bersin, global industry analyst, will discuss how organizations can move from “feedback to action”—and give executives, managers, and employees the tools and information they need to make work better. Join Josh as he explores the role of people and technology as partners in this change, from frequent conversations to AI to action-planning tools, and more. JDRF is an organization with a critical mission: to create a world without Type One diabetes (T1D). In service of that mission, the organization has been been experiencing significant growth and change, similar to changes that organizations around the world are grappling with today. These include revamping its business model in the digital age, attracting, hiring and retaining world-class talent, while actively engaging the community it serves through awareness and relevancy. To meet these changing demands, JDRF recognized the need to prioritize people and culture, not just business systems and processes. With a intentional strategy to thoughtfully overhaul the employee feedback and engagement process, and to build a culture that’s stronger, more innovative, and committed to continuous improvement, JDRF is on track to changing its trajectory, putting it on a renewed path to accelerate life-changing breakthroughs to cure, prevent and treat T1D and its complications. In this webinar, JDRF’s AVP of Talent Development, Madhuri Kumar, will share the journey of JDRF and culture transformation, and provide tactical advice for embarking on change at any organization, large or small. In this webinar presented by Lisa Lebow of Glint and Kurt Oborn of Post Consumer Brands, you’ll learn about motivating and retaining a diverse, dispersed workforce. Lisa, a seasoned organizational development consultant, will explain how to overcome the inherent challenges of engaging a workforce that is composed of all types of employees, from strategy and sales to manufacturing or customer service. She’ll provide a framework for understanding the motivations and challenges of all employees and practical advice for empowering local leaders to take simple, impactful action. Kurt, the Senior Manager of Organizational Effectiveness at Post Consumer Brands, one of the largest cereal producers in the U.S., will share his story — building a program to listen to, understand, and respond to thousands of employees across the country. He’ll provide practical takeaways, best practices, and lessons learned. You’ll walk away with a list of action items to implement immediately, whether you’ve just begun the engagement journey or consider yourself a seasoned expert. In this webinar, presented by Chad Bennett of Glint and Alex Purcell of United Airlines, you’ll learn how you can begin to identify the specific relationships between employee engagement at your organization and the outcomes that drive the business forward. Bennett, a seasoned organizational development expert, will explain how you can effectively use engagement data to predict outcomes, identify high-potential course-corrections, and empower leaders to take simple, impactful action and drive the business forward. Purcell, Sr. Manager, Engagement Technology and Analytics at United Airlines, will relay a real-life case study on how their engagement data impacts their business outcomes. United Airlines’ stated purpose is to help unite the world by connecting people to the moments that matter most. United is delivering on its promise in a complex and dynamic business environment that demands the highest levels of safety, and seeks operational excellence and customer satisfaction. It’s not easy and numerous factors, including weather, maintenance, air traffic congestion, etc., can impact airline operations and a customer’s experience from the moment of ticket purchase to arrival at the destination. But, because the airline business is a people business, employee discretion can make all the difference. So, United is exploring new linkages that aim to show how employee engagement drives improved safety and customer satisfaction, as well as partnering with internal stakeholders providing insights into the effectiveness of their work. How will United prove these connections? That is a question United is daring to ask. For HR leaders, having a holistic view of the employee journey is critical to developing your people and fueling your company’s success. Unfortunately, with ‘survey platforms’, different surveys never talk to one another and data remains captive in silos. But what if you could connect survey feedback and understand the full employee experience in just a few clicks? In times of change, the employee experience helps hold the company together. Whether it be changes to leadership, products, or culture, the employee experience is the one item that should remain constant and strong in order to keep employees engaged. 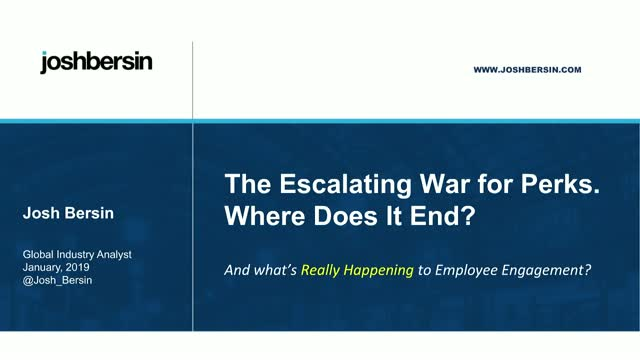 In this research-based presentation, Josh Bersin, Principal and Founder, Bersin by Deloitte, Deloitte Consulting LLP, will highlight the latest trends in the employee engagement market and explain why citizenship, purpose, meaningful work, and “energy, not just engagement” are the most important business strategies you have. Evernote has undergone changes that threatened the stability of the organization’s culture. Yet the fast-growing company continues to thrive. Join Michelle Wagner, SVP of People Ops, as she shares her journey of optimizing culture at Evernote. With input from employees and buy-in from leaders, she has established a new culture strategy— one that’s more intentional, focused, and inclusive. Today, many industries are in the middle of transformational changes. These changes can affect the workforce in significant ways. A longtime executive in the retail industry, Melanie Hughes, EVP/Chief Human Resources Officer of American Eagle Outfitters, has extensive experience in guiding organizations through times of change. - How do you implement change management strategies that keep employees engaged, productive, and motivated? - Learn how American Eagle has optimized employee engagement and performance during a period of transformation, turning engagement into the company’s secret weapon. Clients who choose Ketchum to execute their marketing communications strategies choose us for one main reason: our people. Ketchum people are curious, smart, and passionate - and we consistently rack up accolades for our creativity, execution, and dedication in forums around the world. Above all, only one driving factor represents the foundation for Ketchum's success: our employee experience. Ketchum holds a steady record of being named a top place to work – we are one of the most awarded agencies in the industry, most recently being recognized as one of the top five agencies to work for in North America by The Holmes Report. We drive our people’s success through a commitment to creating a vibrant employee experience, achieved through a healthy mix of programs and flexibility. - This webcast was recorded during an HCI Live Webinar on June 4, 2017. The latest people analytics industry study by Bersin™, Deloitte Consulting LLP, found that mature organizations go beyond mere technical capability. High-impact people analytics organizations incorporate a much wider set of factors like fostering a data culture, forming strategic relationships with business and influential leaders, enhancing HR capabilities, sharing data and insights, and establishing the right infrastructure. We invite you to explore Bersin’s High-Impact People Analytics (HIPAN) research and discover the seven top findings that describe the current landscape and key differentiators of mature organizations. The most challenging part of improving employee engagement is also the most crucial — taking action to improve the right areas at the right time. Catherine Garrod at Sky, Europe’s leading entertainment company, will bring to life how managers and leaders are doing just that: taking the right actions to consistently improve engagement, all year round. In this recorded session, Catherine will share practical takeaways you can bring to your own organization immediately. Drawing on experiences from two contrasting industries, she will demonstrate how simple actions can have a lasting impact across the whole organization. She will also reveal how to guide managers and leaders to figure out what’s the proper course of action for consistently improving the engagement of their teams. You’ll hear how a utility company achieved double digit engagement improvement in two years, which led to their own employees recognizing the company in the Sunday Times, and how teams at Sky are boosting engagement by doing one thing brilliantly. Despite our best intentions, organizational change often leads to disruption. Change can cause confusion, discomfort, and frustration for employees, and can lead to consequences such as drops in engagement, lapses in performance, and regrettable attrition. In a world where change is inevitable, how can organizations overcome disruption and thrive in the face of change? In this webinar, Organizational Development expert Craig Ramsay will share a framework that will help your organization more effectively navigate change, whether the change is a merger or acquisition, an internal restructuring, or a leadership change. Ben Hatch, Employee Engagement Program Manager at LinkedIn, will join Craig to share his journey of helping LinkedIn preserve its culture and values during a period of significant change and uncertainty: the organization’s acquisition by Microsoft. By listening to employees, communicating effectively, and doubling down on LinkedIn’s unique culture and programs, LinkedIn was able to thrive, coming out quickly on the other side more focused and inclusive than before. The critical steps to maintaining a positive and productive culture during all types of change. How to gather and actually use feedback from employees to ensure they are engaged — making the change a success. Key considerations for ensuring a successful transition at the organization-wide and team-wide levels during times of disruptive change. Title: The Escalating War for Perks: What’s Happening To Employee Engagement?